A couple of weeks ago, TCM decided to feature Paul Muni in their Summer under the Stars marathon. Paul Muni has always been an actor that I have been intrigued about ever since I saw him in Scarface. His beautiful performance of an overbearing gangster wanting to make as much as possible before getting out of this world struck me as something unique and unseen by my virgin eyes. I then read some pieces on him how he was very famous during his time, but given his penchant for disguises and disappearing into roles, he did not become iconic like Cary Grant or Jimmy Stewart. 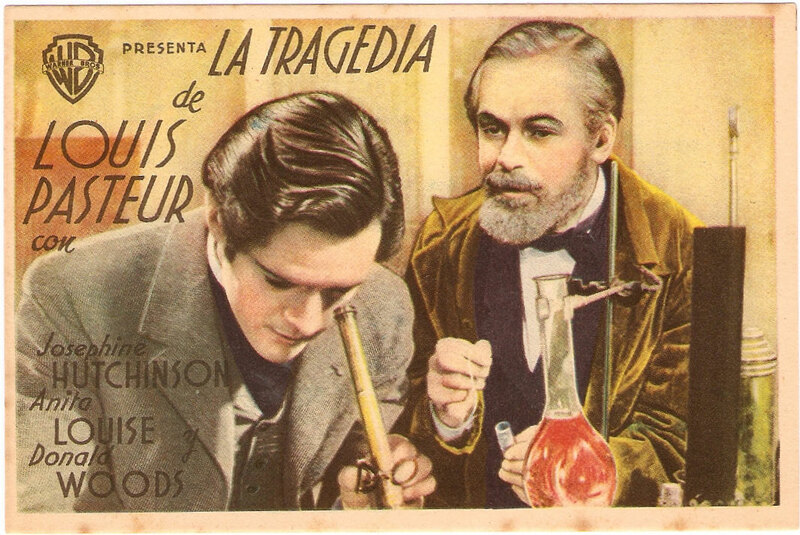 One of these iconic roles that he literally disappeared into was the title character of a biopic called the Story of Louis Pasteur. I had to catch it on TCM and I was so happy that I did. Louis Pasteur is probably best known for his pasteurization experiment that has become the de facto way to preserve milk and make young immune systems strong and healthy. But he did so much more than that. He helped develop a vaccine for rabies, promoted clean hands in the operating room, and advocated for several sanctions that would ensure the health of farm animals. As with any compelling story, Pasteur was considered radical among his scientist peers and many organizations resisted his ideas until he was able to prove they produced consist results. This movie explores the experiments I mentioned above, but also his relationships with his wife, daughter, daughter’s husband, and his scientist peers. This movie does suffer from the pedestal trope that plagues so many biopic features. Pasteur is painted as a noble and righteous scientist who can withstand any setback or hurdle including stroke, public denouncement and the ire of his newly married daughter. He must always struggle to get his ideas heard, but these ideas are the best ideas that anyone has ever heard. But it is overcome by Muni’s performance. He pulls you in even on those terribly overwrought scenes where he is lambasting whatever evil he has come up against and gives you a sense of realism and truth. Whether or not Pasteur actually experienced such hardships, had such a devoted wife and developed so many modern medical practices is not questioned when you watch Muni move from scene to scene. He becomes the man and the legend so thoroughly that it is hard to believe that he once played a hard scrabble Italian American gangster in the twenties.